The UK Paper £5, featuring the image of Elizabeth Fry on the reverse, is to be withdrawn from circulation on 5 May 2017. The note is being replaced by the Winston Churchill Polymer note that has already been released into circulation. Unlike coins, UK banknotes have a guaranteed face value for all time. However, once withdrawn your bank or local shops may refuse them and you will have to take or post your old notes to the Bank of England for replacement. 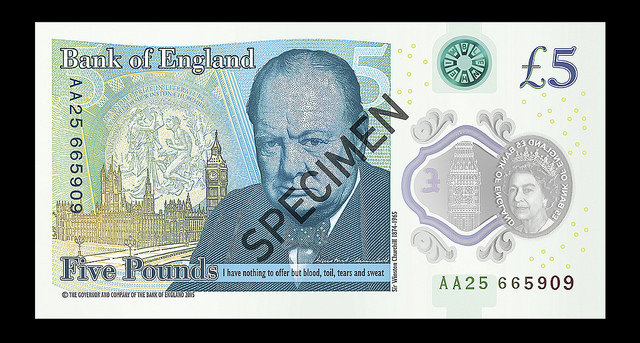 The UK (Bank of England) issued the new polymer £5 note featuring Winston Churchill on 13 September 2016. Polymer was selected as a replacement as it will last 2½ times as long as paper notes, is stronger but flexible. It’s environmentally cleaner and recyclable. 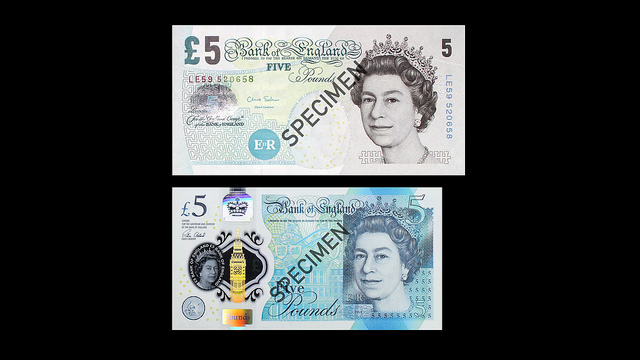 The new note has a range of security features, including a see-through window, metallic images, foil patches, raised printing, very small yet crisp micro-lettering, and an ultra-violet feature that shows the figure ‘5’ under UV light. (Actually the old note was pretty good too, with only 0.0075% forgeries found in 2015). A new polymer £10 note will be issued in September 2017, and a new polymer £20 note by 2020.